Pollution impacts of anthropogenic origin in the Potomac River have been of continuous concern since the 1930s. Following this time, expansion of the human population within the watershed has resulted in the conversion of surrounding land-use into urban, industrial or agricultural centers. Regardless of its origin, point or non-point source pollution can degrade aquatic ecosystem quality and function, alter community composition of fish and other biota, and decrease bed area or growth density for submerged aquatic vegetation (SAV). While non-point source pollution remains a management challenge, active reductions in major point source pollutants have been more commonplace, especially apparent after the 1970s. During this time, one of the biggest contributors of point source pollution in the Potomac River was wastewater treatment effluent. The effluent, commonly released into smaller tributaries or stream habitats, contained high nutrient loadings of nitrogen, phosphorus and suspended organic materials, causing outstanding impacts on biota. Many habitats collecting effluent outflow were hypereutrophic due excessive nutrient loadings. This overabundant nutrient state most commonly resulted in frequent and persistent harmful algal blooms, hypoxic zones and reduced or absent SAV growth. 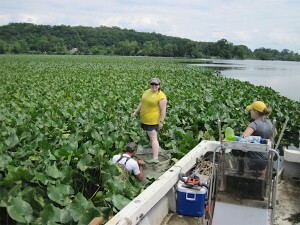 After reductions in wastewater treatment pollution were made, responses throughout the Potomac River’s eutrophic habitats were variable. Typically observed after initial phosphorus and nitrogen reductions, were linear increases in water clarity and decreases in algal biomass and frequency of harmful algal blooms. However, SAV in some areas responded to pollution reductions non-linearly. For example, the tidal freshwater habitats in Gunston Cove, VA experienced decreases in nutrient loadings beginning in the late 1970s. SAV response was significantly delayed until 2005, where SAV bed area increased on average from 70.78 ha before to an average of 179.78 ha after 2005. This resurgence of SAV growth has provided new complex habitat areas for biota to utilize. 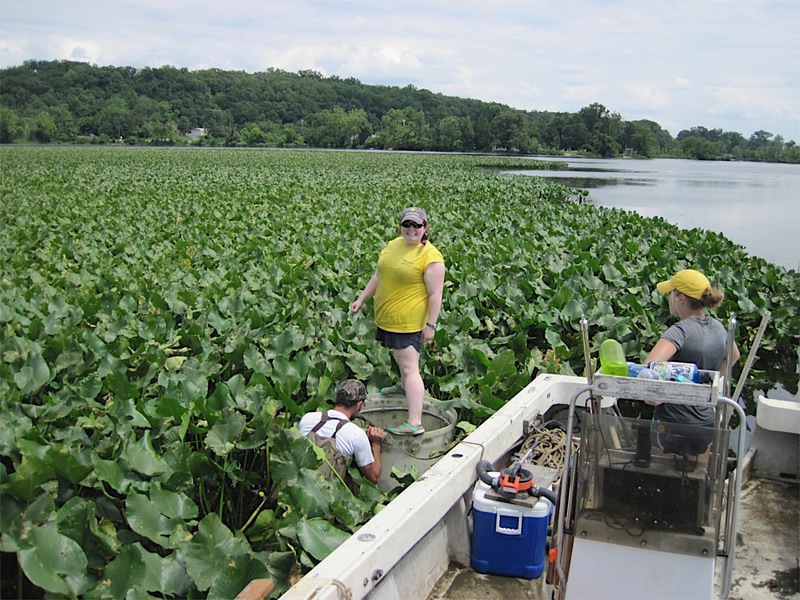 My research provides insight on how changes in water quality, SAV bed area, and watershed urbanization impacted ichthyoplankton assemblage abundance and species composition in Gunston Cove during recovery. Specifically, my research examined long-term trends in ichthyoplankton assemblage structures – focusing on the role reductions in wastewater pollution played throughout the ecosystem recovery. Using field collected ichthyoplankton samples in combination with historical data, I analyzed responses in assemblage structures to increases in SAV bed area, reductions in nutrient loadings in wastewater treatment effluent, and increases in urbanization within the watershed. I used a number of non-parametric analyses to determine that the composition of ichthyoplankton assemblage structures varied significantly over time with increases in total area of SAV. Results indicated that resurgence of aquatic plants created new habitat areas for larval stage fish and spawned eggs that utilize vegetation for some point in their life history, like yellow perch (Perca flavescens) and inland silverside (Menidia Beryllina). I also found increases in several economically and ecologically important species, like the anadromous alewife (Alosa pseudohargenus) and white perch (Morone americana). 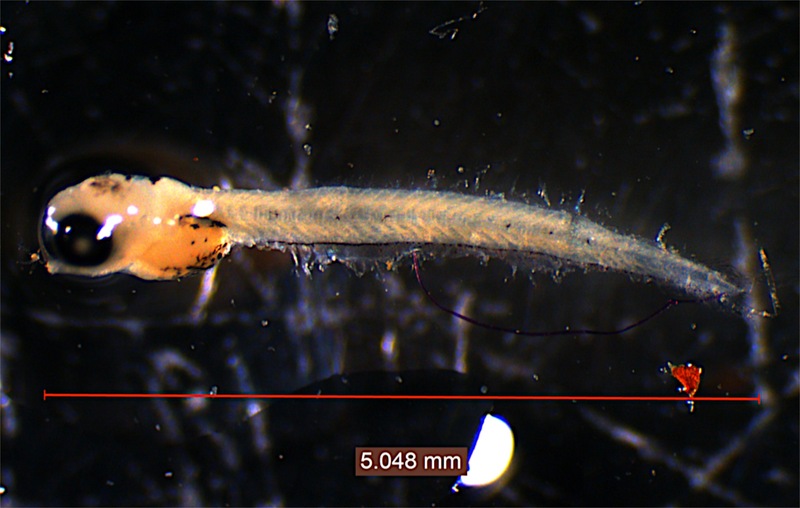 As this work is largely applied, my thesis aims to expand the current knowledge base to provide information on how larval fish assemblages respond in recovering ecosystems used as spawning and nursery grounds for fish. Information from this study can help support the management of valuable commercial species such as river herring, which are sensitive to human driven changes in the ecosystem. While later life history stages of fish have been more commonly monitored in many sampling efforts, analyzing long-term trends in ichthyoplankton assemblages provided critical information on habitat utilization. Because tidal freshwater areas, like Gunston Cove, host not only freshwater, but estuarine and anadromous fish species, a better understanding of ichthyoplankton utilization can report more wholly on the progress of recovery. I would graciously like to thank the Potomac Chapter of the American Fisheries Society for their financial support towards my attendance at the annual American Fisheries Society meeting in Portland, Oregon this past August. Yolk sac stage larval inland silverside (Menidia beryllina) found in drop ring sample collected from Gunston Cove, VA.
Amanda Sills (center) with George Mason University field crew conducting a drop ring sampler in Gunston Cove, VA. This method targets ichthyoplankton utilizing vegetated habitat areas.